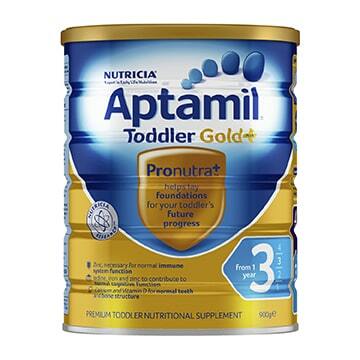 Aptamil® Gold+ 3 Toddler From 1 Year is a premium toddler nutritional supplement. As experts in Early Life Nutrition, at Nutricia we know breast milk is best. With over 40 years of continuous scientific research into breast milk and maternal and early life nutrition, our formulations are developed to support your toddler's progress. Progress: Helps lay the foundations for your toddler's future progress. Science: With over 40 years of continuous research by dedicated Nutricia scientists, paediatricians and nutritionists. Experts: Nutricia Careline team including midwives, dietitians and nutritionists is available to answer your questions and provide support. Aptamil Gold+ helps lay the foundations for your toddler's future progress. - A toddler needs up to 7 times more nutrients than an adult per kg of bodyweight and has a stomach that's 3 times smaller. Their capacity for intake is limited and may result in nutritional gaps. Meeting the growing dietary needs of active toddlers today, means every mouthful counts for the future. - A nutritional supplement formulated to support growing toddlers. - Contains the goodness of cows' milk & 16 essential vitamins & minerals to support normals growth and development. - Zinc, necessary for normal immune system function. - Iodine, Iron and Zinc contributes to normal cognitive function. - Calcium and Vitamin D for normal teeth bone structure. - Contains Omega-3 DHA fatty acid. - Two serves per day provides at least 20-50% of the recommended dietary intake (RDI) of 16 essential vitamins and minerals. - Sucrose (table sugar) free and no artificial colours. Pronutra helps lay foundations for your toddler's future progress. Zinc, necessary for normal immune system function (When prepared as directed and consumed as part of a healthy varied diet.). Iodine, iron and zinc to contribute to normal cognitive function (When prepared as directed and consumed as part of a healthy varied diet.). Calcium and Vitamin D for normal teeth and bone structure (When prepared as directed and consumed as part of a healthy varied diet.). Blend or whisk 1/2 cup (prepared as above) of Aptamil Gold+ Toddler Nutritional Supplement and 1/2 cup fruit. Serve cold for a special treat or as a nutritious and great tasting snack. Dental Hygiene: Encourage your toddler to drink from a cup from 1 year and to drink water regularly. Take your child for a dental visit regularly. Do not use if foil security seal is damaged or missing. Formulated supplementary food for young children. Specially designed to supplement the normal dietary needs of toddlers, when their intakes of energy and nutrients may not be adequate. "Department of Health and Ageing, National Health and Medical Research Council, Ministry of Health Nutrient Reference Values for Australia and New Zealand Including Recommended Dietary Intakes, Canberra: Commonwealth of Australia, 2006. Based on a comparison of the nutritional requirements between 1-3 year old toddlers and male adults, per kg of body weight (based on 70kg adult and 12kg toddler). Milk solids, glucose syrup solids, vegetable oils (contain soy), galacto-oligosaccharides (contains milk), maltodextrin, dried omega LCPUFAs (contain fish, milk, soy, antioxidant (sodium ascorbate, mixed tocopherols, ascorbyl palmitate, dl-alpha tocopherol)), long chain polyfructose, emulsifier (soy lecithin), potassium citrate. Minerals: Calcium, Phosphorous, Magnesium, Iron, Zinc, Iodine. Vitamins: (A, B1, B2, B3, B6, B12, C, D, E), Folic Acid. Note: 1 scoop of powder added to 50ml of water yields approximately 58ml of drink. This feeding guide is a general guide only; your child may need more or less than shown. 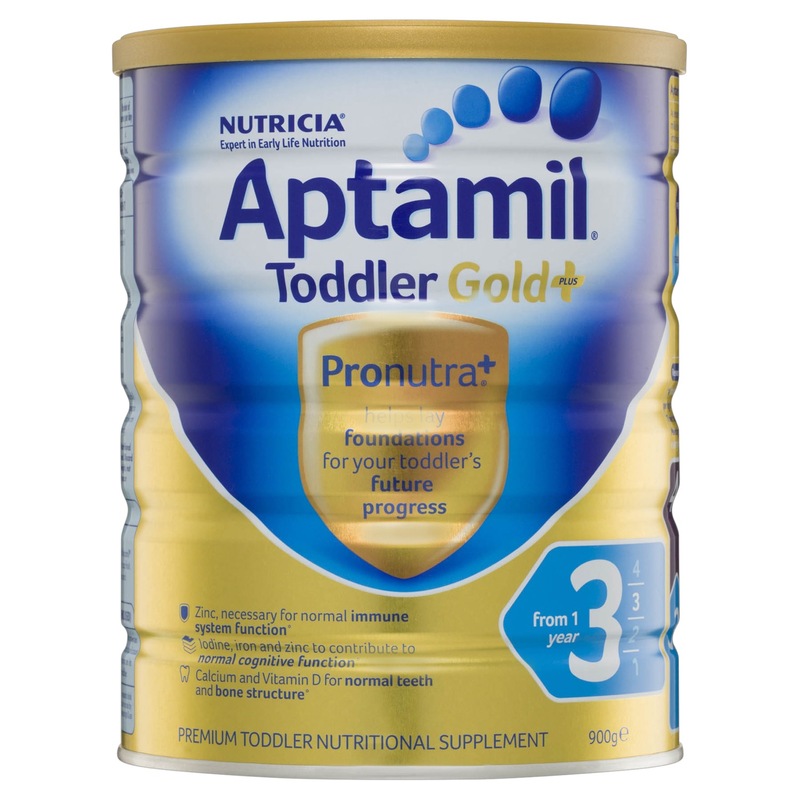 Aptamil Gold+ Toddler Nutritional Supplement powder mixes easily in cool or luke warm water. It has a delicious taste that toddlers love & it can be used as a drink on its own or mixed with other foods suitable for a toddler. 3. Whisk, shake or stir the mixture briskly to dissolve powder. Serve immediately, or for a cold drink chill in the coldest part of the refrigerator for 1 hour before serving. For a warm drink, heat slightly before serving. It is safer to use Aptamil Gold+ Toddler Nutritional Supplement immediately after it is prepared. Discard unfinished drinks. Product is packed by weight, not volume. Some settling of the powder may occur during transportation and distribution. Store in a cool dry place. Use by the date on container bottom. After opening, keep container airtight & use contents within four weeks.